RUSSELLVILLE – A trial date has been set for 13 members of Auburn’s Amish community who have been cited for violating a local ordinance that requires them to clean up after their horses. Authorities have accused the Amish defendants of running afoul of Auburn’s ordinance setting forth the need for large animals traveling within the city limits to be fitted with devices to catch their droppings. The ordinance cites a need to promote public safety. On Wednesday, the defendants appeared in Logan District Court, where District Judge Kenneth Williams scheduled trials to begin Aug. 2. The Amish who live in Auburn are members of a conservative sect known as the Swartzentruber Amish, which rejects motor vehicles and most other modern technology and travels on horse-drawn buggies. The Swartzentruber community decided that using the bags would violate the community’s religious standards, which has left its members at odds with local law. You might remember the Amish from this Logan County community appearing in the news several years ago during an SMV safety triangle conflict which got wide national coverage. Swartzentruber Amish in some communities reach an accommodation with authorities over their characteristically strict lifestyle, different in certain ways from other Amish. If they can’t do that, they may leave for calmer pastures (as seen in Pennsylvania for example). Or more rarely, as we’ve seen in the recent buggy safety changes being rolled out in one Ohio Swartzentruber community, they may actually change their ways to adapt. But it doesn’t sound like that’s going to be happening in Logan County, KY. 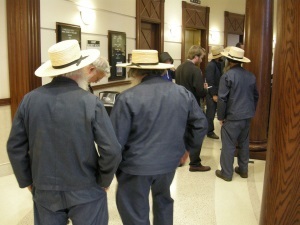 There are 37 pending cases against the 13 Amish defendants. Defense attorney Travis Lock says he’ll be requesting 37 separate trials. Way back in the olden days of our forefathers, the Amish would not fight the law but chose to move elsewhere. In my limited time following the Amish (13 years), it seems to me that you do see more examples of Amish involved in legal disputes in recent years, than what I recall from the mid-2000s. That’s just my impression. But if that’s the case (or if it’s true compared with the olden days as you suggest), any idea why things have changed, Katie? When the Anabaptist fled it was a matter of freedom of religion. It was the same when the Mennonites and Amish migrated to North America, it was freedon of religion. But in this case, it is not freedon of religion. It looks more like a power struggle over horse poop. But hidden under this horse poop are many more attitude issues that are not addressed from both sides of the issue. Thanks Katie. Yes with humans involved, there is always the chance of things being driven by a personal element as well, isn’t there. And by the way your phrase “Power struggle over horse poop” is catchy enough that it might be a fitting title for an article or blog post. But hopefully this thing will be resolved and there won’t be a need for too many more posts. we go to PA every year and you see it every where but i am OK with that…..when it rains it washes it in teh dirt and fertilizes…..
Actually – the Shawnee, Chippewa and Cherokees were there first. Just FYI. In NYC we have fewer horses every year. I speak from 1960 until now and can tell you that before the droppings cool, someone will scoop the valued fresh fertilizer up for their garden in Brooklyn NY. Much better to charge those who leave plastic laying around. You reminded me of this brief photo post of a few years ago. I found some secondary evidence of the manure of which you speak on a visit to Manhattan. By what you say sounds like it is in high demand with the urban garden crowd. Unfortunately, all of us must conform to government standards whether we want to or not, and that includes the Amish. There wasn’t as much EPA involvement 10 years ago as there is today. You can’t even change your oil in your car (or electronics) and dispose of it like you used to be able to. Cities and states are being mandated more and more every day. They aren’t crazy about it either in some cases, but to qualify for state and federal grants to keep their communities going, they must conform. Sometimes, you just gotta pick your battles. This is a bit over the top in my opinion. I live in upstate New York and own a farm. Horse manure will biodegrade on it’s own. It does not cause any more health issue then any other animal droppings that are naturally left. Are they going to site people for letting their dogs go all over? How about the wild? We have wild bears on our property and I can guarantee their droppings are a lot larger than my horses. Sounds like an unfriendly community issue to me. Leave them alone and put the legal system to better use prosecuting people who cause actual crimes. Jemima, this manure conflict may just be a proxy battle due to other unresolved conflicts between Amish and English in the area. I wonder if this issue isn’t something a big friendly community barbecue at one of the Amish farms couldn’t go a good way towards solving? I’m going to guess the interaction between this conservative group of Amish and non-Amish locals is limited. I hate that I am being so angry about the Amish. But they moved in on my road and they do not follow any laws that I have to follow. The township, county and state are afraid of them. They use religion as an excuse to be exempt. I read online that they don’t use phones. Everyday they are at my neighbors using their phone. Everyday I see them riding in my neighbors vehicles, everyday I see them in the grocery store buying hundreds of dollars of junk food. Our township put a fire bill on our taxes to pay for the fire trucks to come to the Amish house burning. My homeowners pays for that bill if my house burns down. Our road is churned up from the steel wheels. Horses tied out in the ditches, cows running loose in the road. Everyday seems like they break a rule just to see if they can get away with it. Ridiculous! Horse manure is biodegradable. How about the paper, plastic trash people litter our streets, roads with? Why continually harass these people? They pay taxes and contribute many good things to communities. Leaving aside the manure issue (I can sympathize with both sides, if I were Amish, I wouldn’t want to bother with a horse diaper everyday and I’ve also heard some say that something along the lines of it could impair the horse, which may or may not be accurate; on the other hand, yes if you’re not used to having it around, manure can be kinda gross, though I can think of worse things), the ins and outs and material details of the everyday Amish lifestyle is not dictated by Scripture and I don’t think the Amish are claiming that they are following all the lifestyle proscriptions seen throughout Scripture. The lifestyle choices are based more in tradition and an instinct against change which could effectively throw the baby out with the bathwater, following from a desire to preserve church, community and family by their tech and material choices. Some Amish of course are much more open to change than others. Swartzentruber Amish are among the most resistant. My suspicion though is this is a lot less about manure and more about some kind of underlying conflict and lack of ties and communication between the two sides. Maybe they got off on the wrong foot; in other areas Swartzentruber Amish don’t have the same kinds of conflicts. But generally when there are conflicts it is usually with Swartzentruber Amish since resistance to chance is hard-wired in the circuitry so to speak. Yeah, I understand all too well about how culture can get in the way. However, the excuses many Amish make for not following the law are claims about how their faith dictates what they will and won’t do. Ideologies dictate cultural practices. So, in effect, their resistance to change DOES have to do with what they believe Scripture dictates. The problem is they’re not always discerning; they apply it to everything which isn’t appropriate. Culture MUST take a back seat to obeying the law. This is true for all communities no matter what their faiths or countries of origin. If they don’t like it they’re free to return to those countries of origin or find themselves in jail cells or paying heavy fines, just like the rest of us! They create their own problems. I’m very interested to see how this will turn out. I was very interested in these comments of yours, Erik, as well as Katie Troyer’s earlier in this post, and the comment from Mark from Holmes County. I am in agreement with all of you — there very likely are some other issues, attitude issues from both sides, etc. I am not familiar with the Auburn Amish community, but want to visit it this fall on my way down to visit in the Ethridge, Tn. community. I think there are several other Swartz. Amish communities in Ky. (Sonora, Liberty, and possibly Park City and others). I wonder if they have faced similar problems in their towns. It would be interesting to read an account of the history of the relationships in general between the Amish and non-Amish in the Auburn area, but I wonder if such an account has been written anywhere. Looks to me like the town/county has decided they are tired of having the Swartzentrubers around, and this is their way of saying it. But his is not a religious issue; it’s the Swartzentrubers being hard headed. We are told to follow the civil laws as long as they do not conflict with God’s law, and in all my reading of the Scripture I have yet to see a prohibiting on horse diapers. Well said Forest Hazel! If it were a matter of the civil law violating God’s law, it’d be a completely different issue and God’s law would take precedent, in ANY Christian community. I believe that, many times, certain Amish like to claim an issue is a religious one when it isn’t. It’s a convenient excuse. Perhaps there isn’t any intent to be defiant and they actually have convinced themselves it’s a religious issue. However, when one looks at Scripture it becomes evident that it’s a matter of stubbornness. At that point they need to turn, become humble, and submit to the authorities. I don’t understand how a material bag to catch droppings is against their religion. It’s not like its an electric mechanism, it’s a bag! I’m all about leaving them alone and let live, but it’s a bag for goodness sakes. There are enough distractions for a horse without a STUPID bag tied to them. The way people come roaring up on buggies, cutting them off, people honking their horns, trucks roaring around them, people yelling obscenities, throwing objects at the horses & occupants of the buggies, I’m surprised more Amish people aren’t killed by English drivers. We need to PRAY for their daily safety instead of being so CRITICAL! Praying for them and their safety IS what we do, as well as pray for the safety of everyone else who ISN’T Amish. That’s not the point. The county in this case is being rather petty but that’s not the point either. The point is that the Amish, along with every other American, has a responsibility, especially because their faith commands it, to be obedient to their civil leaders and the law as long as it doesn’t violate God’s Law. It doesn’t matter how petty WE think the law is. God doesn’t allow us to defy that authority. In this case, some of the Amish are claiming a religious reason for not doing what God commands which is in direct contradiction to their claims of being obedient to Scripture. The criticism is NOT towards their faith but towards the MAN-made rules that aren’t even supported by Scripture. Those man-made rules are the cause of all the trouble, because they’re confusing those rules with obedience to God’s word. Praying for them is great but it doesn’t change their defiance of the law. Just as praying for a starving person isn’t the only thing we need to do. We need to feed him! The Amish need to be helped along as well and sometimes that help comes in the form of constructive criticism and suggestions by the English. Here in Wisconsin we had a similar case near Loyal and Greenwood with Swartzentrubers. The Amish were having trouble with the Loyal community so they quit going there. This led to the grocery store closing and one of the two convenience stores closing as well. The Amish now shop in Greenwood a few miles away. In this instance there were enough Amish families in the area to make a boycott be felt. And fortunately there were no court cases. This is big farming country. How many times have you seen a manure spreader dropping more stuff on the road than in the field. Stuff happens. Interesting, John. Looks like there are around 5 churches there so something maybe even a couple hundred families. A store boycott could have some pop. In Logan County there is just one maybe two districts, so we’re talking more like several dozen families maybe. I’d guess those store owners were on the pro-manure side or if not, soon wished they had been. I go thru Logan county every once in awhile…there are not that many buggies, or horses on the road to make horse poop a problem. Just my opinion. the basic problem, it that small minded bigots, want everyone to adhere to their quirks. Hence the Nazi-style ordinances. Adhere to authorities? the Brethren left Europe because of oppressive government passing unnecessary, oppressive or even lethal “laws”. Wait did we Real Americans not take on the entire British Empire over such. Seems the problem is not the Amish rather the mamzers in local government. the Amish & all decent people should just boycott the businesses. It is often amazing that Aholes change their “moral” standard when losing gelt. While I recognize there are two sides to every story, those who cite an irrefutable Biblically-centered requirement to submit to civil authority might reflect on the fact that the religious oppression in Europe from which groups like the Amish, Mennonite, etc. fled centuries ago was often executed via civil law, albeit unjustly. If an ordinance is created to target a specific group, especially one with deeply held religious convictions, it’s treading on some very thin ice, Constitutionally speaking. It’s worth considering that their appearing in court is a form of submission to civil authority, albeit informed by the fact that their religious beliefs are protected by law that would supersede any ordinance. Anyways, for a case pertaining to a ordinance violation in a small town, this certainly will be interesting to watch. So this is a battle of the words the Amish put on paper (the Ordnung) and the words the English put on paper (their “laws”)? What this should be about is property rights. Who owns the road? That obviously is “we the people” which puts an easy solution not within easy reach. Private ownership of roads would make this much easier to sort out….as the owner could just decide based on what was good for his customers and his business. As things stand, if the Amish are collective owners of the road, then a case can be made that they have a right to let their horses shite on the road. So the ordinance is about ‘public safety’, huh? Well, I can see that many people do not want to drive in horse manure on the roadway so they swerve around it creating a issue with cars swerving on the city streets. That IS a hazard. As for the manure itself, only those ignorant of reality could say that the manure is a human health hazard. I have been around conservative Amish for about 20 years, and after spending 30 or so months living with them, I can say that Amish step in horse manure, bare footed, from the time they are very young until they are quite old, and no one gets sick from it. City people who have no experience with horses don’t know these things, but equate horse manure to human manure in toxicity which is just silly. Then someone tells Amish people who have lived their entire lives in such environment that it is unsafe and they look at each with astonishment! There are those that say that the only biblical function of secular government is the punishment of evil doers. Read Romans 13 in that light, and you won’t see this ‘disobedience’ by the Amish as quite so disobedient to God. Having the state legislature functionally slap the Logan county governments in their faces by ending their enforcement of the SMV sign law created a issue with these governments having vendettas against the Amish. Since they cannot push the SMV law, they created a horse manure law. Once this is resolved, if the government loses again, they will just keep finding ways to make the Amish lives there uncomfortable. Human nature in action. I have a unique perspective for you Lance. If people swerve into another lane, without first making sure that doing so is safe, it is they THEY that are the hazard. Is it the fluoride in the water, or the government schools that keep people from being able to think and reason? FWIW I happen to live in Seymour MO and I have yet to meet anyone dumb enough to be swerving to avoid horse manure in the road. In October, the Auburn City Council approved a first reading that amended the ordinance to remove the collection bag provision. A second reading passed the following month, and the change officially became law. More than a dozen citations remained pending in court until Wednesday, when Logan District Judge Kenneth Williams dismissed the cases, according to attorney Travis Lock, who has represented the Amish defendants. Lock said his clients are thankful to be able to return to a largely quiet existence.